12 x 68 x 3 3/4 in. Using over 1000 envelopes in 1992 I first made this work entitled, Fallen. Ten years later, recycling the same envelopes I added the books. Two communing books, one blue, one red, oppose one another. The title of the blue colored book is Etiquette by Emily Post, and the red book, Soviet Politics at Home and Abroad by F. Shuman. 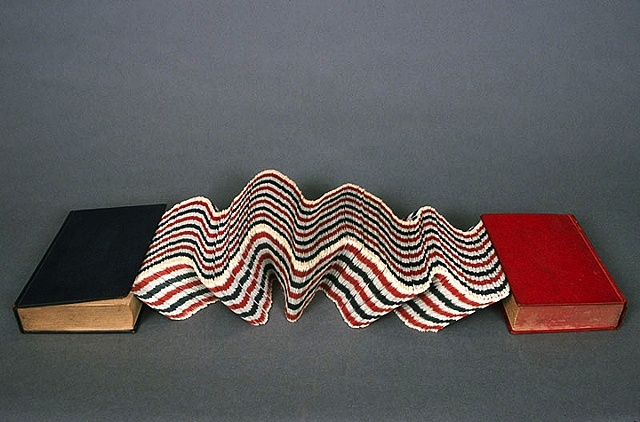 Spanning the divide between these two volumes are approximately four- thousand red, white, and blue airmail envelopes, held together by their own weightgravity, without glue or tape to keep the myriad pieces in place. Collapse implies connotes the failed politics of the ability of the East and West systems of government to communicate with each other. and The envelopes, artifacts of the industrial era, also imply thea disintegrating network of the snail-mail postal service.